We are delighted to provide these limited time offers on our award-winning products. Be sure to visit this page regularly to see new hot deals. If you have any questions about any of the special offers, email our Sales Team at sales@conceiva.com. Ultimate Home Entertainment Pack - Save $15.00! Mezzmo Pro and DownloadStudio are "must-have" tools if you like watching and listening to the latest music, TV shows and movies. Use DownloadStudio to download all your favorite movies, TV shows, movies, music and photos. Use Mezzmo Pro to automatically stream all your downloaded files to the DLNA devices in your home or outside your home. This is the ultimate streaming solution for your home! Competitor Discount - Save 50% off Mezzmo Pro! Have you purchased any of these DLNA/UPnP media servers*? This is a LIMITED time offer, so hurry while it is available! If you have previously purchased any of these products*, then we want to give you one more reason to make the switch to the best media server on the planet. 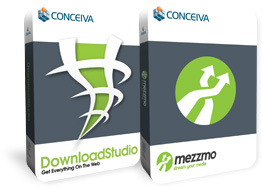 For a limited time, we will give you a 50% discount on Mezzmo Pro. That's right, buy Mezzmo Pro for only $14.97! Email our sales team with the purchase receipt and/or the registration details of the DLNA/UPnP media server that you have purchased. Your registration details must be able to register the current version of one of the products listed above*. Our sales team will test the registration details that you send us. Warning: Do not send us illegal, cracked or warez registration codes. We are aware of these and will reject your request immediately. After confirming your purchase/registration details, our sales team will email you a special coupon that you can use when purchasing Mezzmo Pro from the Conceiva web site. This coupon will give you a 50% discount. It's that simple! *Purchased a DLNA/UPnP media server that is not listed above? Contact us with your purchase details and you may still be eligible for the 50% discount! Get Mezzmo Pro for FREE! Simply create a video about using Mezzmo Pro! Like Mezzmo Pro? Want to get it for FREE? Simply create a video about your experiences using Mezzmo Pro with your TV, Blu-ray player, tablet, smartphone, games console or other UPnP/DLNA device and share it with others. Post the video on popular video sites like Youtube, Facebook, Metacafe and Dailymotion. Send us the link to the video and you may be eligible to get Mezzmo Pro for FREE! Create a short video (1-2 minutes is fine) about using Mezzmo Pro with your TV, Blu-ray player, tablet, smartphone, games console or web browser and post it on popular video sites for others to see. Popular video sites include Youtube, Facebook, Vimeo, Dailymotion and Metacafe. Other sites may be accepted. Languages other than English are acceptable. Make sure you add a description with your video on the video web site so that users can find it. For example, "Using Mezzmo Pro media server to stream MKV videos to my LG BD645 Blu-ray player" or "Getting IMDB video artwork for movies using Mezzmo Pro". Email our sales team with the URL (or web address) where you have posted your video. Make sure your video is on a public video web site that we can view without membership or logging in. After checking your video, our sales team will email you a serial number and license key for Mezzmo Pro. It's that simple! Important: Make sure your video is placed on a popular, well-visited video web site that we can access without membership or logging in. Your video must be seen using a web browser. It should not be an advertisement for Mezzmo Pro or it will be rejected. Our sales team are the sole judges whether it is positive, well-visited and not an advertisement. Conceiva may link to your video as part of its marketing.